Thanks to a hugely successful fundraising effort led by Brandon College and Brandon University alumni, a symbolic staff that represents student leadership will soon be back in the hands of students. For decades, the Senior Stick and Lady Stick were some of the most senior roles in the student executive at Brandon College. Although their precise roles and responsibilities changed over time, they were generally seen as president and vice-president of the entire student body, working with the heads of other student organizations and class year presidents to help the college’s social and student life run smoothly. Not just a title, each Stick also carried an actual stick — a ceremonial wooden staff, about three feet long, topped in silver, and covered in silver rings that bore the name and year of every previous officeholder. After the positions were phased out in 1967, when Brandon College became Brandon University, the staffs were placed on display in a custom-made case in the university library. Now, the case and the Lady Stick are housed in the S.J. McKee Archives at BU, but at some point in the intervening years, the Senior Stick had gone missing. Brandon College and BU alumni raised nearly $6,000 to re-create the Senior Stick, as authentically as possible, and will present it back to students and student government in a special ceremony during the BU Homecoming Awards Banquet. The replica is as authentic as possible, featuring a vintage wooden staff, a custom-cast silver headpiece, and custom silver rings with hand-engraving of the names of all previous Senior Sticks, including Tommy Douglas, who was Senior Stick in 1929–30. To recreate the Senior Stick, BU turned to Alex McPhie, a Winnipeg-based archaeological silversmith who specializes in old-fashioned metalwork. Basing his work on the existing Lady Stick as well as photographs of the original Senior Stick, McPhie crafted a reproduction that is as faithful as can be to the original. The total cost of the recreation, including several ounces of solid silver, came to just under $5,300. Because alumni went above and beyond with their fundraising, the additional money will help cover the costs of mounting the two sticks in the case, ensuring it is secure with a new lock, and producing a permanent informational plaque. The recreated Senior Stick will be presented back to Brandon University, and to BU students, in a ceremony tomorrow evening. The McKee Archives will be custodian of the sticks, and it’s hoped that they will once again go on permanent display in the library. 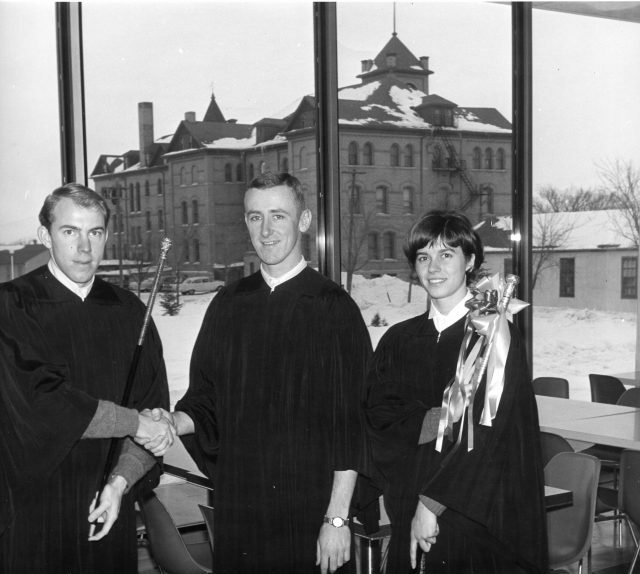 In the future, the Senior Stick and Lady Stick could once again be used for special occasions, such as Convocation, Homecoming, or students’ union elections. BU’s Homecoming weekend continues all day tomorrow with brunch, campus tours, the dedication of the McCutcheon Alcove, and an awards banquet. The weekend wraps up with a farewell brunch on Sunday. In 1919-1920, all of the societies of Brandon College amalgamated into one students’ association. The Christmas issue of The Quill that year is the first to list the position of President and Senior Stick, although the text indicates the term “senior stick” had been used in previous years around the college. Prior to 1919, the main student executive appears to have been the Literary Society, for which there were elections every year. Presidents of the Lit Society (1910-1918) could be either male or female. The position of Lady Stick first appears in 1923-1924.